Country music’s biggest event wal held yesterday. 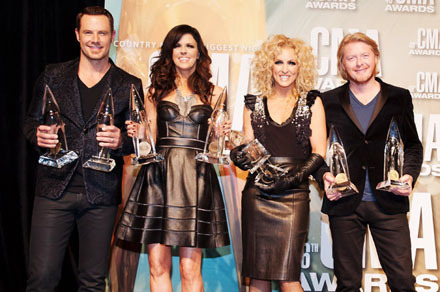 The 46th annual CMA Awards broadcast yesterday was full of surprising winners. Blake Shelton leads the CMa 2012 winners with three accolades – having bested such country music giants as Jason Aldean, Brad Paisley, Kenny Chesney and Taylor Swift. 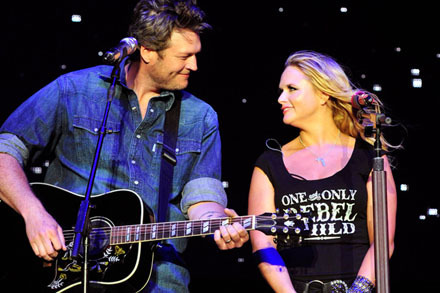 Blake’s wife and co-writer Miranda Lambert helped him to scoop the award in Entertainer of the year category, but it was just one of Shelton’s awards. He also scored male vocalist of the year and got a little choked up when he and Lambert’s song Over You won song of the year. The couple, who wrote the track about the car accident that killed Shelton’s older brother when he was teenager, gave an emotional acceptance speech. Lambert was seen getting teary-eyed, as Shelton spoke onstage. Of course, recurring hosts Brad Paisley and Carrie Underwood were there for all of the action — which airs live from Nashville annually — though some may say they have the easy job. The hardest part of the CMAs is likely choosing winners from an endless list of country music talent. 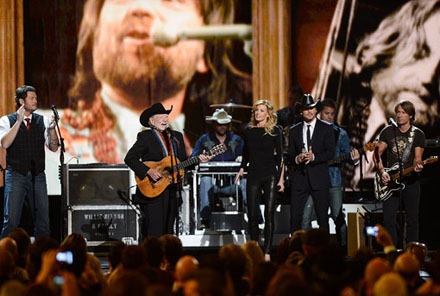 There was also a star-studded tribute to Willie Nelson featuring Tim McGraw, Faith Hill, Shelton and Lady Antebellum. Super Bowl 2012: How Super was Madonna's Halftime Show?